These headphones look and sound great, are light weight and can connect to any device in at least one of three ways. Both sound and microphone are average for phone calls, the control scheme isn't exactly intuitive and remembering how the controls work can be difficult. No matter how you want to use headphones, whether Bluetooth, analog or digital, the Elements are a great choice. The feature set of the Monster Elements compared to their retail price makes this an easy decision. Their Design makes them an attractive pair of headphones that can be worn as a fashion statement, and their Sound Quality makes them the best headphones in their price category. Whether you intend on using them in digital, analog or Bluetooth mode, you can be sure that the sound will be unlike any other headphones you can buy. A lot of thought was clearly put into the Design of the Elements. The finishes make for a very fashionable and unique look, which can make them not only a great pair of headphones, but also a statement piece. Wearing them in public, I have often received questions about make, model, etc. The individual swivel earcups are really nice for DJs, but also in scenarios like on an airplane where you want to keep your music playing, but don't want to miss the flight attendant. The only really obvious issue is the placement of the two possible audio cables: USB and 1/8". The 1/8" connector is situated slightly in front of the bottom of the left earcup, mounted between the main plate and the cushion. This places the cable in front of your left shoulder, easily running the cable to a computer or media player. The USB connector, on the other hand, is situated slightly behind the bottom of the right earcup, mounted on the main plate. When using it for audio instead of charging, it brings the cord down onto your right shoulder and likely away from the computer you are trying to connect to. An easy solution to the problem is a longer USB cable, or ideally one with a tiltable micro connector. The Element shave 3 different ways of listening to music: USB digital, 1/8" headphone and Bluetooth. All three offer what Monster is best known for: what they call Pure Monster Sound. The idea is that what you hear is exactly what the producer intended for you to hear. There are no on-headphone adjustments to bass or treble, meaning that you hear the track exactly as it exists. USB digital is the best way to use the Elements with digital music. Full digital audio from the source to the headphones guarantees that there is no place within the system that can create loss. When you combine that with Pure Monster Sound, you are going to hear exactly what you are supposed to hear with no adjustments, loss or interference. Using this method with music, the quality is astounding. When you use it with television or movies, such as Netflix, you will hear details that you may have noticed otherwise. 1/8" is the best way to use the Elements with analog audio, though it can obviously be used with digital audio as well. When connecting to an analog source, such as a record player, you again eliminate the sources for interference and loss. Combined with Pure Monster Sound, you will hear exactly what exists - clicks, pops and everything. With a digital source, such as a phone or computer, it is always possible to introduce interference. The included cable and adapter will limit it as much as it can, but the source is converting digital to analog and then transmitting it over the cable, so anything is possible and will depend on the device. Bluetooth is always the last resort for quality audio, as the maximum bandwidth for Bluetooth is far lower than that of USB, creating a need to compress the audio, and the possibility for interference is greater than analog. 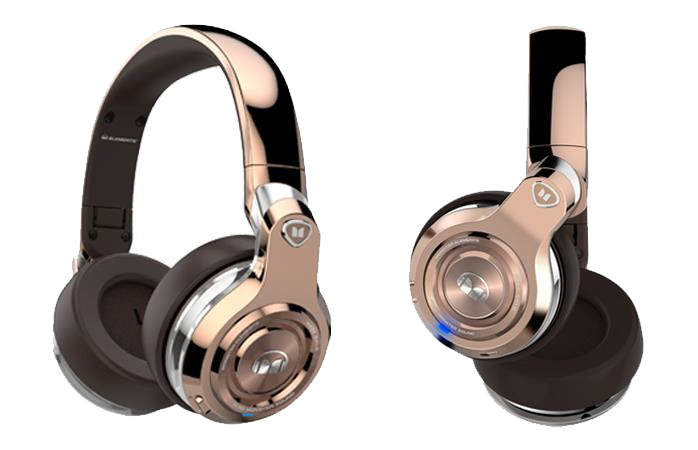 In Bluetooth mode, the Elements have two sound modes: Standard and Club. Each mode has its own purpose and ideal user. The Standard mode is the in-tuned Pure Monster Sound. The Club Mode, on the other hand, adds extra bass, for those who enjoy that soundscape. It is best for electronica, hip hop and anything with an intentionally strong bassline. The Elements have all of the connections you might expect from headphones in their category, plus one that you might not. Of course, they offer the traditional headphone connection that almost all devices have had for decades, meaning you can use them on televisions, radios, computers, tablets and phones. They also offer the ability to connect via Bluetooth, so you can use them with many of the same devices, but without the inconvenience of a cable. Where the Elements set themselves apart from most other headphones is their digital connection. In addition to charging them, the micro USB connection also allows you to connect the headphones to a computer, or other device that supports USB audio, and eliminate the analog connection entirely. Like Apple said when they removed the headphone jack from the iPhone 7, an all digital connection increases the Sound Quality. The range on the Elements is decent, but is not the best we have seen. I tested the range using a paired Microsoft Lumia 650. In a 3 bedroom apartment, with the Lumia 650 in the center, I was able to use the headphones in all rooms. In the far bedroom, though, there were occasional signal drops. This is the part of the apartment that has the most walls separating it from the phone. In addition, there are a lot of electronics in the apartment. With all of that said, it means that I could pair the headphones, leave the phone just about anywhere and still be able to walk around the apartment, doing housework, and not have to carry my phone for the most part. Bringing the Lumia 650 outside, the Elements were able to remain connected stably for a distance of 65 feet. With the advertised Bluetooth 4.0, the technology could have a maximum range of 200 feet, though that is using lower bandwidth. Because more bandwidth is needed to get the desired Sound Quality, the maximum is diminished. 65 feet, however, is an incredibly long range, and more than a normal consumer usage would call for. Unlike most headphones, these have experienced a tremendous amount of use before writing this review. Because of this, we have had a lot of practical tests, but still performed our traditional battery test as well. During a friend's wedding weekend, the Elements provided entertainment during down times. Throughout the weekend (in the hotel, traveling between venues, etc. ), the Elements were used in Bluetooth mode for music, Netflix and more. By the end of the weekend, the headphones were just below half capacity. Based on this experience, it is difficult to find a scenario which the battery will not exceed. Running our internal battery test on the Elements, we averaged 25 hours and 23 minutes. of playtime across three separate tests. The company advertises 24 hours of playtime, which means that the battery lasted about 5% over the expected life. Obviously, running headphones for over a full day straight is an unlikely scenario, expect maybe flying around the world, but it is comforting to know that, if needed, you can spread that battery over a few days without charging. The sound quality when used for a phone call is far below the quality when used for music, though it is above the average call quality. On the wear's end, the sound is a little bit muffled. During silences there is a slight, but constant hiss that is obvious. Most of that is a result of Bluetooth calls as a whole; a problem we see often with stereo headphones being used for phone calls. It seems to be an issue with the Bluetooth standard more than the Elements. On the receiver's side, the sound coming through the microphone is as good as the microphone built into the phone. Switching from the internal mic to the one built-in to the Elements was indistinguishable to the person on the other end of the call. The controls on the Elements are split into two control groups: button and gesture. There is a single button and a single gesture area, meaning that these items are reused for several commands. These controls affect everything from power to equalizer, volume to track selection. Unfortunately, these controls are only active in one of the three connection modes: Bluetooth. Assumedly this is because of power requirements, though in digital audio mode, the USB cable would provide power and a connection to the device over which the commands could be executed. The primary use of the button is for power. Holding it for a few seconds will power the headphones on, and will reconnect to a paired device within range. If you haven't paired the Elements with any devices yet, or you want to pair them with a new device, simply keep holding the button after it powers on to enter pairing mode. Once everything is on, paired and connected, the button gives three more commands. First, a double button press will switch between equalizer profiles. The Elements have two equalizer profiles: Natural and Club. The Natural profile is the traditional "Pure Monster Sound" that sets Monster headphones apart, and Club adds bass to the mix. Second, while on a phone call, you can mute and unmute the microphone with a double tap. A long press will turn the Elements back off again. For the three standard commands, the headphones will speak to you to let you know what they are doing. For equalizer mode, you will only get a beep to let you know the mode has changed, but the headphones will not announce the mode that they are currently in. Hopefully you will be able to determine that just by listening. Between the two Monster logos on the right earcup is a Palm webOS-style gesture area. Here you can perform several single gestures to control a variety of aspects of both the headset and the paired device. Pressing the gesture area for 2 seconds will activate the paired device's Bluetooth command mode - Cortana for Windows, Siri for iOS and OK Google for Android. Swiping up will turn the volume up, while swiping down will turn the volume down. The volume controls are the only ones that do not affect the paired device, but instead control the volume inside the headsets themselves. For audio playback, a single tap will act as a play/pause button - starting or stopping the playback of the audio on the paired device. A double tap will skip ahead a track, while a triple tap will skip back one track (restarting the current track or moving to the previous, depending on the media player). For call connections, the same gestures have different results. A single tap will answer an incoming call or an incoming call-waiting call, while a double tap will switch between two active calls. Holding the area for 2 seconds will reject an incoming call or switch the call from the headphones to the handset. Here's where things get really interesting: pressing the gesture area AND the button together will redial the last call. While the Call Quality is above average, the Noise Cancelation is average. While speaking on the phone, I tested average daily sounds. While sounds like water running and vegetables cooking were not distinguishable on the other end, sounds like a spoon tapping on a pan were clearly distinguishable and heard loudly. If you were using the Elements for phone calls while performing noisy activities, the person you are speaking to will hear much of what you are doing. There are a lot of Controls available on the Elements, and they are very similar to one another, depending on the mode the headphones are currently in. Remembering the values of multi-taps on both the button and gesture area can be complex, especially if you don't use the features often. If you regularly use the media aspect, but not often the call, you might not remember, or even know, what the commands are, and they are not intuitive. Once you get a feel for the commands, though, they are fairly easy to use. The only other real issue when first interacting with the Elements is finding the gesture area itself. There isn't a lot of physical diversity in the Design to allow for a lot of tactile feedback. Fortunately it does not take a whole lot of time to get used to the placement, and usage gets a lot easier. The Elements have been a fixture in the PLuGHiTz Live Studio for nearly a year and have experienced both short and long recording sessions. Under almost all circumstances the headphones have remained incredibly comfortable. The headband is just tight enough to keep the headphones on your head, and loose enough to not put too much pressure on your ears. The adjustable positioning allows for all head sizes without adding any additional pressure to the earcups. The only issue that I have experienced is in wearing a baseball cap. If you don't place the top of the band behind the dimple on the top of the cap, it will put a lot of pressure on your head and, in fairly short order, will begin to hurt. The simple solution is to pay attention to where the headband sits on your head. Working in broadcast means that we encounter and experiment with a lot of audio products, specifically headphones and microphones. The Elements have, without a doubt, the most attention to detail I have encountered on a pair of headphones in their price range. When the band is collapsed, all of the seams are level, with no open spaces to catch on clothing, bags or other items. When the earcups are closed for travel, the hinges are tight, preventing them from reopening on their own. One of my common issues with headphones is the handling of screws. While many companies ignore them entirely, Monster has decided to use them as part of the look of the Elements. The exposed aspects of the screws are colored to contrast interestingly with the color they are within. For example, a red screw on a field of black. The most important build decision, of course, is the material used for the earcups themselves. The chosen material is incredibly soft and durable with enough give to make sure the headphones remain comfortable.